How Much Does It Cost To Repair Fiber Cement Siding? Fiber cement siding is an excellent looking and incredibly effective method of exterior wall covering gaining much in popularity with homeowners everywhere. Just as when installing the material, during repair there are various precautions that must be taken and a certain level of awareness that must be had. For one, fiber cement is rather heavy compared to other materials. When performing a fiber cement siding repair, you want to confirm that your contracting team has the adequate tools required to ensure that the dense and hard material can be properly cut and that dust spread is kept to an absolute minimum. Environmentally friendly, built more sustainably and uses fewer trees than traditional wood siding. Resistant to fire and essentially will not burn in nearly every case. Unlikely to rot and can extend the life of your home's exterior paint. How Much Will It Cost To Repair Fiber Cement Siding? Fiber cement siding repair costs can be a bit higher than some other cheaper materials such as plastic and wood, but as discussed earlier, the benefits of maintaining fiber cement siding are many. For the sake of providing rough estimates for the cost to repair fiber cement siding, we'll use an area of 500 square feet. For that space, expect to spend anywhere between $2,600 and $7,900 including materials, labor and cleanup costs. The average fiber cement siding repair job will cost $4,600 but ultimately the final cost will depend on the type of material you have on your home, the type of damage present and how large the area of siding is that requires repair. Another variable that comes into play when addressing a fiber cement siding repair job is the underlying material's condition. Depending on the age of your home, how the original installation was done and what your climate is like, you might have water damage, mildew or rot under the siding. 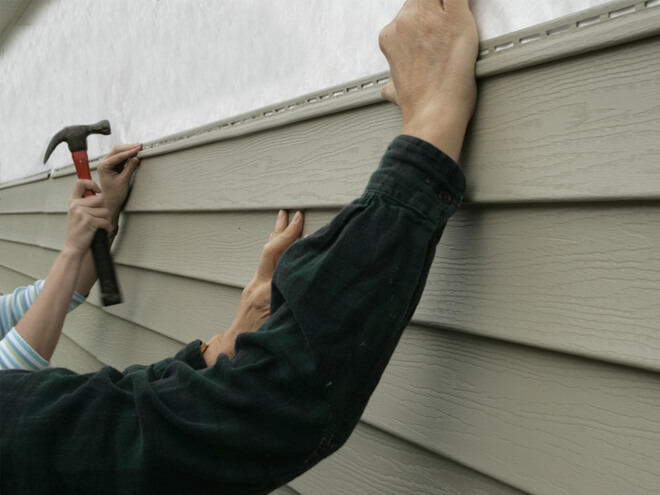 Your fiber cement siding repair team will investigate the possibility that your underlying material will need to be repaired or replaced and will advise on any related costs. It's smart to address any damage to the exterior of your home quickly to ensure that any problem doesn't progress. Get in touch with a local professional to give you a free estimate on the cost to repair your fiber cement siding. The cost to repair fiber cement siding will inevitably be lower if the damage is cured quickly rather being let alone to get worse. If you'd like to discuss a fiber cement siding repair job with some local contractors, simply enter your home zip code into the form provided on this page. Local professionals will reach out to you with no-obligation, 100% FREE estimates for their services. When assessing an estimate, be sure to compare apples-to-apples and make sure that each competing quote you receive includes all associated costs, including material charges and cleanup. It also pays to ask potential fiber cement siding repair contractors to provide references of previous clients and to show you pictures or video of their previous jobs.